"To the Congress of the United States: As We the People vote today we are asking you to do your part and end the blame-game politics of Washington. Partisan bickering cannot solve the crucial issues we face. America deserves better." Ok. I get it. Unity08 is firmly opposed to partisan bickering. Wow. What a strong and courageous position for Doug Bailey and company to take. You've just got to admire that kind of conviction. Fine, the petition is harmless enough. I signed it. I'll even put their promotional banner in the sidebar. Why not? 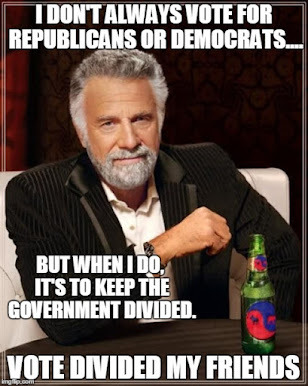 I am as against "partisan bickering" as the next man. Go to their site, sign the petition. I have posted my thoughts on Unity08 before, and I won't rehash that here. It is just so painfully obvious that the "unity" in Unity08 will last exactly as long as they support no actual candidates, have no platform, and have no opinion on any actual issues, and will not last one minute longer. As I said in my earlier post: "Best to delay as long as possible. Certainly there is no point in risking taking a stand on an issue, before they have raised a few million dollars...". Lets just call this post a place-holder for me to link with a giant "I told you so" post a year or two from now. 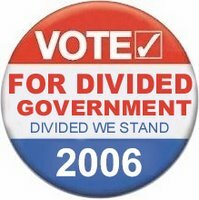 If a divided Republican/Democrat ticket in '08 is a good thing, why wouldn't a divided Republican/Democrat government in '06 be equally good? "Unity08" is a high concept, high dollar coordinated campaign founded by PR professionals and Washington insiders who are attempting to tap into the rich vein of disaffected voter and overall dissatisfaction with the status quo. They received quite a bit of positive press when the organization was announced in the spring. 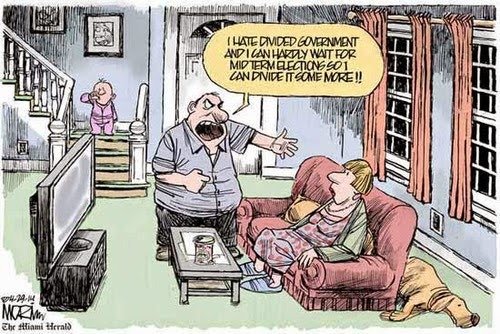 "Divided Government" is a meme without any organized support that has been promoted by a few bloggers, economists, political scholars, authors and columnists. 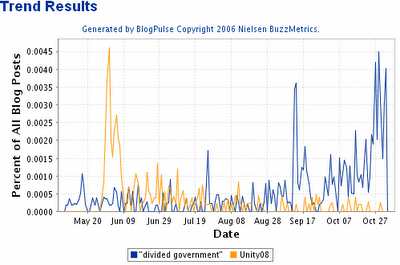 Yet "divided government" is now getting more press, more discussion, and more attention than Unity08. In the last week I have heard: an Indiana farmer interviewed on NPR saying that he was voting for "divided government"; the President asked explicitly about "divided government" in a press conference; the vice president asked about "divided government" in a televised interview; and a conservative financial pundit touting a "divided government" bull market on his TV show. Unity08 is promoting a meaningless petition in '06, while voters embracing the idea of divided government may be the very reason that the Democrats take control of the House of Representatives next week. There is a lesson here for Unity08. It is not too late for Unity08 to become relevant in '06. It is just so painfully obvious that the "unity" in Unity08 will last exactly as long as they support no actual candidates, have no platform, and have no opinion on any actual issues, and will not last one minute longer. Thank you! I've been looking for people to point this out. We already have two semi-viable third parties--the Greens & the Libertarians. You wanna support them getting on the ballot? Great. You want to create some fantasy party that takes no stands & doesn't exist? Don't be silly. Thanks for the comment. I suspect that the Unitons are lusting after a McCain/Lieberman ticket. Possible but highly unlikely. Net net - any "mainstream" presidential candidate will only fall back to a Unity ticket if they have already failed to secure a nomination from the Republican or Democratic parties. They'd have to be blindly ambitious and/or wildy arrogant to believe they could become President on that path... wait a minute ... blind ambition? insane arrogance? ... OK. Maybe they will give it a try.